Simple ingredients + easy directions = a killer looking and fabulous tasting dessert. When it comes to baking this is my favorite equation! These darling little cakes were sooooo incredibly easy to make that even I couldn't screw up the final product. It is possible that you could have the ingredients to make this yummy dessert in your kitchen right now, that's how no fuss this recipe is. Press about a tablespoon and a half of the graham cracker mixture in to each one of the paper cups. Bake in the oven for 6 minutes, remove from oven and let cool. Again reset your oven to 325 degrees F.
While the crumb crust is baking, blend together with a hand mixer the cream cheese, lime juice, sugar and vanilla extract. Then add in the eggs one at a time blending until all the yellow yolk disappears. Divide the mixture between the 12 cups and then bake in the oven for about 15-20 minutes or until the cream cheese mixture is set. Cool on wire rack for 30 minutes then cover and place in the refrigerator for a minimum of 4 hours. Now this is why I used the foil and paper baking cups. Remove the foil cup and then gently peel the paper cup off of your cake and discard. 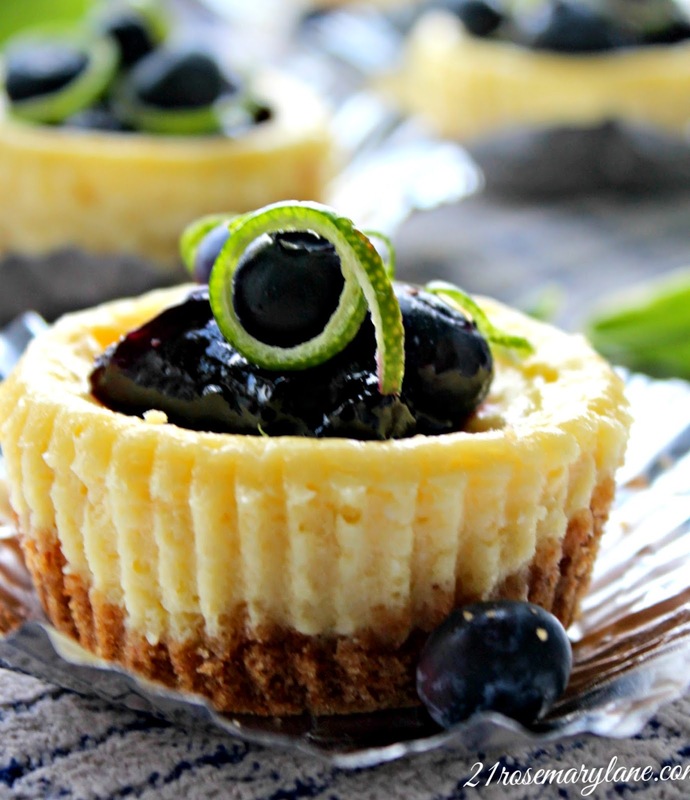 Place your cheesecake back onto the opened foil cup and top it with a dollop of blueberry preserves, three or four blueberries and garnish with some lime zest. See how easy this was. And yes my kiddies and Mr. Rosemary Lane loved 'em! These look delicious! 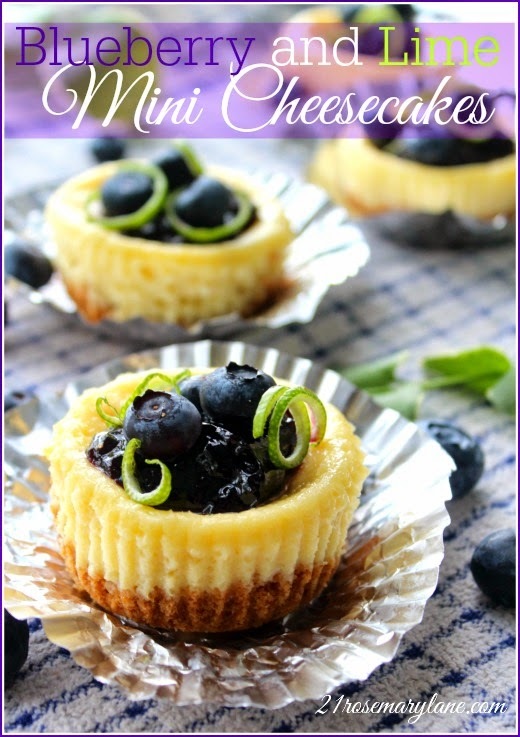 I love anything lemon and will definitely have to give these a try!
) I care for such information much. I used to be looking for this particular info for a very lengthy time. Oh my, this looks soooooooo delicious. Thanks for the recipe and thanks so much for linking to Inspire Me. Sounds so refreshing and look delicious Barbara! Thanks for sharing the recipe with SYC. Made these today but when it came to adding ingredients, I didn't see when to add the 1/3 cup sugar. I guessed and added to the filling mixture. Was this correct? They look great and we plan to eat tonight. Oh these look delicious. Thank you for sharing with Foodie Friends Friday! Hope to see you next week!